Movement is Medicine. Movement is for Everyone. Move Well, then Move Often! Welcome to the website for Andrew Brown (Level 2) and Lauren Rae Brown (Level 1), MovNat® Natural Movement Fitness Certified Trainers in Birmingham, AL. 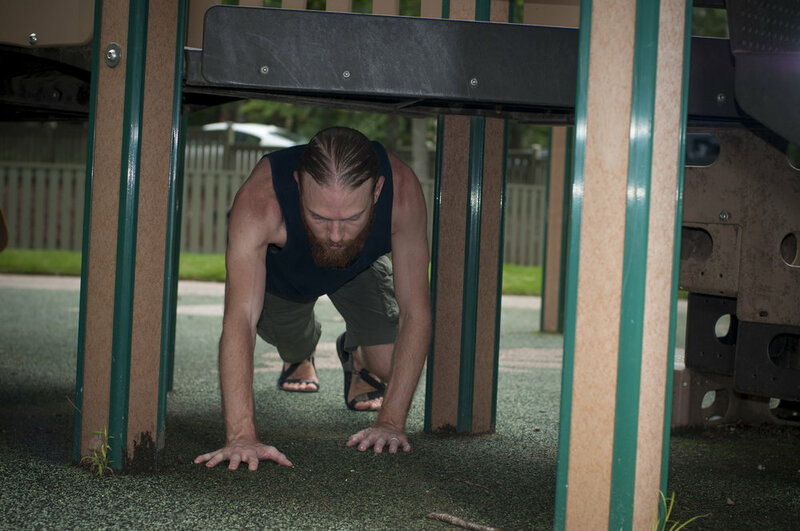 It is our goal to help people get stronger, become more capable, and to reconnect to their own physicality and nature through the practice of Natural Movement®. This includes children, seniors, and everyone in between. This training is entry level, as it is adaptable to people of all physical abilities, but is also incredibly complex and elite. It spans fitness and movement rehabilitation, can be practiced indoors and outdoors, and offers simple solutions to combat strain and restriction from sedentary or repetitive tasks. Don't let any photos give you the impression that natural movements are not for you, there are many progressions and regressions for all movement categories. The human body is designed/adapted for being in motion most of the day and to move through full ranges of all movements every day: movement complexity and adaptability is our biological and ancestral inheritance. As modern people, we have largely lost our need for movement as well as our love of movement, and we have suffered greatly for it both physically and mentally. It is up to us to rescue our declining health. This is our biological call of duty. "We have been given a body to honor and strengthen through movement. We are given a mind to forge strong. A soul to keep alive and free. No machine should ever dictate and shrink you. Let movement shape your body and mind. Movement makes you strong, so your strength keeps you moving. Don't wait for a magic pill. Start moving, and say to yourself: If I don't empower myself, who will?" Organic Movement / Fitness / Play! "I really enjoyed the class. Besides it being a lot of fun, it challenged me physically and mentally to go beyond what I thought I could do to finding and rediscovering movement capabilities I hadn't attempted in years. I was able to start at my comfort level and progress with new challenges each week. I was encouraged and excited to push past fears and accomplish the moves with confidence. The most helpful part was the impact the activities had on my shoulders. I have a history of shoulder injuries which left me with limited range of motion and daily discomfort. After the class, my shoulders were pain free. It was so impressive, I've incorporated the movement into my workout routine. I am glad I attended these classes. " - Adrian W.